Saint Catherine Eastern Orthodox Church of Hagerstown of the Orthodox Church in America (OCA) is pleased to welcome you to our Website. Saint Catherine is the oldest Orthodox Church serving the Lord in Western Maryland. We are excited to share that in December 2016 marked our 35th Anniversary in Hagerstown, Maryland. For most of the 35 years of our Parish, V. Rev. Fr. Dennis Buck has served as our Priest. Services are in English, with Greek, Slavonic, and Romanian sprinkled in spontaneously. Our parish is distinguished by the large number of priests sent out from our parish and also the high ratio of children to adults in our congregation. We are a community of believers who are always happy to see new faces, so bring yours in today and let your voice raise up with ours in a sacrifice of prayer and praise to Him who rose from the dead, trampling down death by Death. If you have ever wondered where the 1st historic church of Christ disappeared too, look no further, it never disappeared. 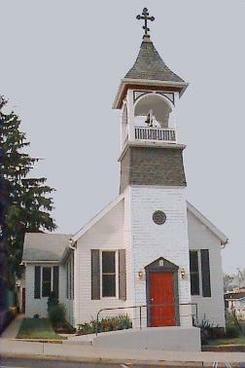 Come visit our humble parish and learn more about the Church responsible for assembling the Bible and responsible for keeping the faith connected together through time, undivided now for over 2000 years. The Orthodox Church has a rich history worth investigating. Learn how strong her walls are and how they have stood the test of time. Born in Scranton, PA on November 3, 1928 to John & Anna (Rachko) Mason, he graduated from St. Tikhon’s Theological Seminary on Memorial Day in 1950. In May of 1951, he married Doris (Daria) Millian of Old Forge, PA. He was ordained a priest by Bishop John of Chicago on October 7, 1951 at Holy Protection Cathedral in New York City. ​Father John served parishes in Robins, OH; Altoona, PA; Meriden CT; Akron/Mogadore, OH; Yonkers, NY; and Wilkes Barre, PA. Upon retiring to Hagerstown, MD, he continued serving at area parishes in several jurisdictions. After the death of his beloved wife of 63 years, Father John moved back to his former parish of St. Nicholas in Mogadore, where he was attached.​Archpriest John Mason, 90, fell asleep in the Lord on Thursday, January 31, 2019 in Cuyahoga Falls, Ohio. On St. Nicholas Day 2018, he became the first recipient of the Order of St. John of Chicago, honoring his 67 years in the priesthood. During his 1970 trip to Alaska for the canonization of St. Herman, Father John was able to visit the grave of the Saint on Spruce Island. This became a special moment in his life. Father John’s steadfast leadership resulted in new churches being built in Meriden and Mogadore. He was known as a kind and loving pastor by generations of the faithful. OCA, serving for 23 years. He was a National Spiritual Advisor of the Federated Russian Orthodox Clubs (currently FOCA). Father John was a member of the Fellowship of Orthodox Stewards and St. Tikhon’s Century Association. Visitation and services for Archpriest John will be at St. Nicholas Orthodox Church, 755 South Cleveland Ave., Mogadore, OH. On Monday, February 4, visitation will be from 5-7pm followed by the Funeral Service for a Priest at 7pm. On Tuesday February 5, visitation will be from 8-9am followed by the Divine Liturgy at 9am. Interment will be at St. Tikhon’s Monastery, South Canaan, PA.
Below are some great resources if you are looking for more information about Orthodoxy or if you just need a refresher course. Saint Catherine Orthodox Church is a member of the Orthodox Church of America. Visit the OCA website to learn more about Orthodoxy, her mission here in America, and other important information about the undivided One Holy Catholic Apostolic Church. FASTING TIME IS UPON US. Need help encouraging your children to participate in fasting? CLICK HERE for a 2-MINUTE podcast from the internet Orthodox sensation Be The Bee that may encourage them and excite them to learn more about being Orthodox! .His Beatitude, Metropolitan Tikhon visited Saint Catherine's December 15th and 16th, 2018 and joined us for Vespers. He also led us in celebrating the Liturgy. Saturday night after Vespers His Beatitude shared his new book "Of What Life Do We Speak - Four Pillars for the Fulfillment of the Apostolic Work of the Church." "Now, therefore, you are no longer strangers and foreigners, but fellow citizens with the saints and members of the household of God, having been built on the foundation of the apostles and prophets, Jesus Christ Himselt being the chief cornerstone, in whom the whole building, being fitted together, grows into a holy temple of God."